2دانشجوی دکترا، دانشگاه آزاد اسلامی، واحد سبزوار ، گروه صنایع غذایی ، سبزوار ، ایران. 3استادیار، دانشگاه آزاد اسلامی، واحد سبزوار، گروه صنایع غذایی ، سبزوار ، ایران. امروزه تولید و استفاده از مواد غذایی و نوشیدنی های رژیمی و فراسودمند رو به فزونی گذاشته است.با توجه به اینکه کربوهیدراتها یکی از مهمترین منابع افزایش دهنده کالری می باشند، بسیاری از توجهات در صنعت غذا به کاهش استفاده از این منبع مهم و جایگزینی آن با شیرین کننده های بدون کالری یا کم کالری معطوف گردیده است. با توجه به اینکه، شیرین کننده های طبیعی و سنتزی بسیاری برای جایگزینی ساکارز در مواد غذایی استفاده می شود، اثرات شیرین کننده های مصنوعی و جایگزین بر روی ویژگیهای محصول نهایی قابل توجه می باشد.استویا یک شیرین کننده گیاهی مناسب است که در بسیاری از مواد غذایی رژیمی به عنوان جایگزین شکر مورد استفاده قرار می گیرد. در تحقیق پیش رو اثر مصرف قند استویا در جایگزینی با ساکارز در تهیه نوشیدنی زعفرانی به عنوان یک نوشیدنی فراسودمند بررسی شده است. بر این اساس در تهیه شربت زعفرانی 5 تیمار 100%، 75%، 50%، 25%، 0% از قند استویا جایگزین ساکارزگردید. سپس خصوصیات فیزیکوشیمیایی، رئولوژیکی و حسی آن بررسی شد. بر اساس نتایج حاصله، با افزایش استویا میزان بریکس، دانسیته، ویسکوزیته و pH شربتها کاهش یافت وهمچنین از نظر حسی نیزبا افزایش قند استویا امتیاز کمتری کسب گردید. بهترین تیمار در بین تمامی تیمارها، نمونه حاوی 25% استویا و 75% ساکارز می باشد که در مقایسه با دیگر نمونه ها از نظر خصوصیات حسی از پذیرش بالاتری برخوردار بود واز لحاظ خصوصیات فیزیکوشیمیایی مشابهت بیشتری با نمونه شاهد داشت. 1Graduate student of Department of Food Science and Technology, Sabzevar Branch, Islamic Azad University, Sabzevar, Iran. 2Graduate student of Department of Food Science and Technology, Sabzevar Branch, Islamic Azad University, Sabzevar, Iran. 3Assistant professor of Department of Food Science and Technology, Sabzevar Branch, Islamic Azad University, Sabzevar, Iran. In recent years production and usage of functional food and drinks is one of the public and scientist’s interest. Since carbohydrates have been recognizedas the major calorie source in many food baskets, most attention has been focused on substitution of sucrose with non-caloric sweeteners. Although both natural and synthetic sweeteners have been used in the formulation of food stuffs, deep concern is raised regarding safety aspects of synthetic ones. Stevia is a natural suitable sweetener that is currently being used as a substitute for sugar in many dietary and functional foods and drinks. In the present study the effect of using stevia sugar as a replacement for sucrose in the preparation of saffron beverages was investigated. Accordingly, saffron syrup was prepared with 5 treatments in which100%, 75%, 50%, 25% and 0% of stevia sugar replaced sucrose. Then, the physicochemical, rheological and sensory properties of saffron functional syrup were investigated. The results indicated that by increasing stevia brix level, density and viscosity increased but the syrups’ pH decreases. The best treatment was the sample containing 25% steviaand 75% sucrose that compared to other samples regarding sensory characteristics had a higher acceptance by consumer and regarding physicochemical and rheological characteristics more similar to the control sample. Abdalbasit, A., Gasmalla, M., Yang, R., Musa, A., Hua, X., and Zhang, W. 2014. Physico-chemical assessment and rebauidioside A. productively of natural sweeteners (Stevia rebaudiana Bertoni). Journal of Food and Nutrition Research. 2(5): 209-214. Agrawal, S.G., et. al. 2006. Method for the extraction of saffron pigments and flavor concentrate. US Patent. Patent no: US 7070823. Alizadeh, M., Azizi-Lalabadi, M., and Kheirouri, S. 2014. Impact of using stevia on physicochemical, sensory, rheology and glycemic index of soft ice cream. Food and Nutrition Sciences. 5: 390-396. Alizadeh, M., Azizi-Lalabadi, M., Ansari, H., and Kheirouri, S. 2014. Effect of stevia as a substitute for sugar on physicochemical and sensory properties of fruit based milk shake. Journal of Research and Reports. 3(11): 1421-1429. Carbonell-Capella, J M.,. Barba, F J., Esteve M J., Frígola, A. 2013. High pressure processing of fruit juice mixture sweetened with Stevia rebaudiana Bertoni: Optimal retention of physical and nutritional quality. Innovative Food Science and Emerging Technologies 18: 48–56. European Commission. 2011. Commission Regulation (EU) No 1131/2011 of 11 November2011 amending Annex II to Regulation (EC) No 1333/2008 of the European Parliament and of the Council with regard to steviol glycosides. Official Journal of the European Union, L295, 205–211. http://eur-lex.europa.eu/LexUriServ /LexUriServ.do?uri=OJ:L:2011:295:0205:0211:EN:PDF. 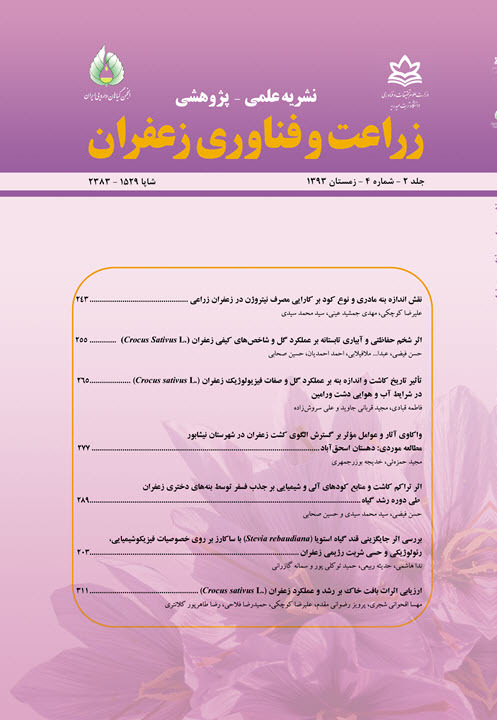 Homayouni Rad, A., Delshadian, Z., Arefhosseini, S.R., Alipour, B. and AsghariJafarabadi, M. 2012. Effect of inulin and stevia on some physical properties of chocolate milk. Health Promotion Perspectives. 2(1): 42-47. Gazerani, S., Mohammadi Sani, A., and Tajalli, F. 2013. Effect of solvent extraction on qualitative parameters of saffron edible extract. Research and Reviews on Biosciences. 7(3): 15-27. Goyal, R., Samsher, K. and Goyal, S. K. 2010. Stevia (Stevia rebaudiana) a bio-sweetener: a review. International Journal of Food Sciences and Nutrition.61 (1): 1–10. Gwinn, R. 2013. Technology and ingredients to assist with the reduction of sugar in food and drink. Food and health innovation service. http://www.foodhealthinnovation.com /media/6741/industry_position_ papers_-_technologies_to_reduce_sugar.pdf. Kadkhodaee, R., Mehmandoost, N., and Namvar Mahbob, M. 2012. Unit Operation & Fundamentals of Engineering. Research Institute of Food Science & Technology (RIFST). Lisak, K., Jelicic, I., Tratnik, L. and Bozanic, R. 2011. Influence of sweetener stevia on the quality ofstrawberry flavored fresh yoghurt. Mljekarstvo. 61(3): 220-225. Raiesi Ardali, F., Alipour, M., shariati, M.A., Taheri, S and Amiri, S. 2014. Replacing sugar by Rebaudioside A in orange drink and produce a new drink. Indian Journal of Research in Pharmacy and Biotechnology. 2(2): 1131-1135. Saniah, K. and Sharifah. M. 2012. The application of Stevia as sugar substitute using response surface methodology. Journal of Trop. Agriculture and Food. Science. 40(1): 23– 34. Sharrif Moghaddasi, M., 2010. Saffron chemicals and medicine usage. Journal of Medicinal Plant Researches. 4(6): 427-430. Yousefi Asli, M., Goli, S., and Kadivar, M. 2012. . Optimizing the production of low-calorie jam "quince" Using artificial sweetener stevia. Journal of Food Science Researches, 22(2): 155-164.